Someone on the Texas Juggling Society's mailing list posted a job that they found on Craigslist. I followed up with the person and now I'm going to be juggling at a corporate party on 9/15. It hadn't occurred to me before to keep an eye on Craigslist for things like this, but now I'll be searching it on a regular basis. Went to the Ringling Bros. show on Saturday with my oldest daugher (9 yrs). We had a blast. Hardly any juggling at the show, but the graphic design was great. I enjoyed the all black-and-white costumes in the show opening. There were a lot of height-oriented, heart-stopping bits....some antics at the top of a sway pole and the show climax, a wheel of death. The sway pole act involves climbing to the top of a long flexible pole. At the top is an apparatus for holding on, and then you make the pole sway. I have to stop there, I might faint. Here's a photo of a sway pole. I'm working on a new routine called "The Massacre of the Carrots." The idea is that I'll come up with 20 or more ways to kill a carrot. I've got a list. It's not so much that carrots have ever hurt me. It's just that they're so darn smug. Carrots are sort of the canonical thing to use when you do knife juggling and you want to prove the knives are sharp. They're great for that because they're not too messy, and because even dull knives can cut carrots. Heck, you probably know that you can cut a carrot with your finger. Well, my kids didn't know, so I was able to pull that trick on them. It's going into the show. I need something to tie the whole thing together though. Maybe some way to transition from one carroty death to another. Oh, it'd be neat, too, to be killed by the carrots myself at the end, maybe. Somehow. If you've got ideas, add 'em in the comments. I did a Balance and Motion show for the 2nd graders at Summit Elementary last week, and it went really well. I did a thirty minute presentation where I talked about the physics of balance and motion as it relates to juggling tricks, explaining each trick in terms of the vocabulary from the 2nd grade Balance and Motion unit. The kids get a huge kick out of it, and the teachers loved how it ties into the science unit. I want to perform this routine at more elementary schools, I just need to get contacts at more schools around town. Of course my daughter really enjoyed it, since she got to be my helper during the show. I brought out my unicycle for this act, which I'm doing more and more lately...I've developed more strength and it's easier to use the uni in smaller spaces now -- and it's a lot of fun. This month I'm trying to master continuous behind-the-back throws in a 3-ball routine. So far, the most I've done has been 4 catches. But I think I've got the process dialed in...I learned I have to throw the balls quite a bit higher than I expected to gain the time needed to free my hands for the next throw and catch. I'm actually doing this mainly as preparation to do continuous behind-the-back throws with clubs. Oddly, on my first attempt at that, it didn't occur to me to work with balls first and it took a suggestion from someone at a Texas Juggling Society meeting to give me that little breakthrough. I mean, if I was telling someone else how to learn to do anything at all with clubs, I'd suggest that they learn the trick with balls first....but I didn't figure that out on my own, when it was me. Of course, part of that is because I can already do individual behind-the-back throws in the middle of a club pattern, so I felt like I ought to be able to move forward from that. But continuous behind-the-back throws is a whole 'nother animal. Here is a sort of montage-video someone made of Jugglefest 2008. It's now becoming a sort of annual routine to take one of my kids on Saturday and then tak e a different one on Sunday. Neither really juggles yet, but they're starting to try some things out. Nothing is as cool as watching some fantastic juggler from out of town, like the Belgian guy who performed Saturday night, Stijn, do his public show...and then getting to walk right up to him at the festival the next day and talk to him, get some pointers, and try out some tricks. Someone had a 3' diameter walking ball. I used to use one of these way back in ... sheesh, 1989 or so... when I was working at a summer camp that had a circus program. I tried a 4-man box-shaped club passing pattern. I wasn't very good at it but it was a lot of fun. There was a lot of rotation involved. I don't know why we don't see more of this on the public stage. Oh, wait, I do: because 4 people would have to practice it. Still, it was really neat. I can't believe I forgot to post about this. The Texas Juggling Society's annual Jugglefest is this weekend. It gets bigger and better every year. Details are on the web site. I'm going to do a Balance and Motion show for my daughter's 2nd grade class. The 2nd grade curriculum includes a unit on Balance and Motion, which is what inspired this show in the first place...my son's teacher asked me to do a piece about this a few years back, and then I took the show to some other schools. All juggling shows use balance or motion in some fashion, so the props make a fun way to demonstrate some of the principles that the unit covers, like counterbalancing, forces, gravity, spin and roll, and an axis. Learning to use a devil stick, for example, is all about balance. You allow the stick to fall to one side of the control stick, then tap it above the centerline to throw it to the other stick. You start a propellor trick by catching it below the centerline and following it as it rotates. 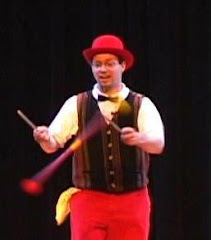 I'm juggling for the Pack 90 cub scouts this February 28, at their Blue & Gold Banquet.